​Everyone hates potholes. Unfortunately, they are a fact of life in Pennsylvania, thanks to our severe freeze/thaw cycle. What exactly do we mean when we say freeze/thaw cycle? Well, temperatures in Pennsylvania can fluctuate between freezing and mild daily during the winter months. After precipitation occurs, the water seeps into the soil below the roadway surface. When it gets colder, the precipitation freezes and the ground expands, pushing the pavement up. Then, the weather warms and the precipitation melts, leaving a gap between the pavement and ground below it. When a vehicle drives over the cavity, the pavement surface cracks, falls into the hollow space, and creates a pothole. In 2016, PennDOT invested $35.2 million for pothole repairs, using nearly 53,000 tons of asphalt. And PennDOT maintains the same number miles of roads as New York, New Jersey, and New England combined! During the winter, crews will make road repairs when possible — meaning when the weather permits. Because of the temperature, pothole repairs will only be temporary, using a mixture called cold patch. Cold patch is asphalt mixed with soap, water, and fine stones. The soap and water allow the material to remain flexible so crews can work with it. After the soap and water evaporate, the material becomes hard. In the spring, the state's asphalt plants open and warm mix becomes available for more permanent repairs. Warm mix is a mixture of pure asphalt and fine stone heated to about 250-265 degrees Fahrenheit. The pothole is cut square, cleaned, and then treated with a tack-coat of asphalt that acts as glue. After the tack-coat application, the hot mix is placed into the pothole and compacted using a roller or other device. Learn more about how PennDOT patches potholes and our other maintenance activities with our Maintenance First cards. 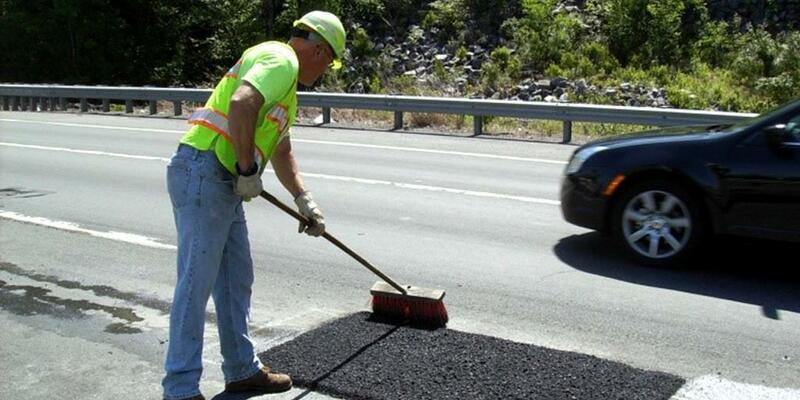 Report potholes and other roadway concerns by calling 1-800-FIX-ROAD or by visiting customercare.penndot.gov. Follow PennDOT on social media — Facebook, Twitter, and Instagram​.